A very amusing puzzle and logic game is familiar lines and balls games. Amusing Balls - A very amusing puzzle and logic game is familiar lines and balls games. Consist of five games. Excellent sounds schemes. Help with rules, control and strategy of game. Many skins, set of figures, tables, sound schemes. Many possibilities for children, because you can change quantity of balls or quantity next figures. Good support from web. In the next versions many games will be added. 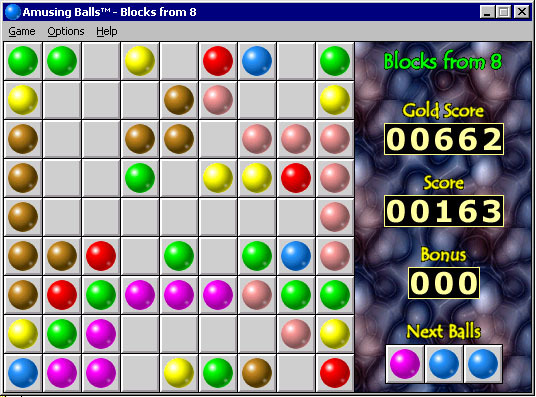 Main enhancements to make this game stand out against the other dozen consist in new possibilities movement of balls. You can to put one ball over other ball in this game only. Color will be changed. Set of figures: Download file and unzip in folder '...\Amusing Balls\Figures' where installed Amusing Balls. Skin: Download file and unzip in folder '...\Amusing Balls\Skins' where installed Amusing Balls. Fruits Game - A maddeningly addictive puzzle game with a casino flair. FreakOut Gold - Think fast as this sizzling hot game seduces your puzzle-solving skills in a way you've never experienced! Flip Words - Make words and solve phrases! new flip words game free download to have a try. Funny Faces Game - Pop balls, spin crazy faces and score points in this colorful puzzle popper! Funny Bubbles - Funny Bust A Move style game. new funny bubbles game for you ! Free download to have a try! Doctris Deluxe Game - Doctor Smith's laboratory got contaminated by malicious viruses. Electra Gmae - Everybody wants to be a superhero: but some of us have to be electricians! DiamondMine Game - Play the puzzle sensation that's sweeping the nation! Puzzle Express - Travel across the country loading up the Puzzle Express with beautiful pictures.